We’ve all found articles of clothing that could change our lives forever. Maybe it was a perfect party shirt that would differentiate us from the crowd, a uniform for a new job, or a special accessory we splurged on just to test the satisfaction of a financial boon. But sometimes these acquisitions fail to live up to their expectations. We all have clothes that go unworn, tools we never use, books whose covers we loved but whose information we’ve never taken the time to absorb. Some of us flaunt our individuality even within the limitations of a uniform. Others of us can’t seem to fully lose ourselves into the sharp creases of one even if we try. If identity is supposed to be expressed through the consumption and assumption of physical elements, then maybe those physical elements can create an identity free from human inefficiency. The balance of self and symbol is at the center of John Harlan Norris’ portraits. Each of his paintings feature a figure both revealed and concealed by the symbols of the subject’s occupation. With simple titles like Diplomat, Opponent, or Programmer, his portraits provide an illustration of the conversation between roles and the way we assume them. 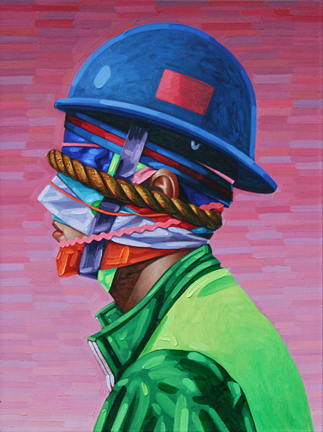 Norris’ work is a contemporary take on the occupational portrait, a type of image used for centuries in painting and photography that displays an individual wearing clothing associated with and holding the tools of his trade. They can present anonymous stereotypes or strategically identify an individual with his job. Americans, with our preoccupation with our work selves and status, have fully embraced this kind of portraiture in various forms through history, especially in the early days of photography. The better we are at our jobs, the better we are as people. In Norris’ paintings, though, the tools of the trade become more than signifiers, and the figures are concealed underneath the symbols and tools. The result is a portrait that leaves us with nothing to recognize the individual by. Norris believes the dispersion of people, ideas, and attitudes has been accelerated in the past twenty years of our digital age. People don’t fill roles within their community so much as find communities where they can take the role they want to play. In a world cluttered by visual announcements that have no bearing on us personally, presenting an outward representation of the type of culture we represent is a way to reduce the friction as we search for people like ourselves. Norris has a long list of titles in his notebook for future paintings. Titles in both senses of the word, both as a name of the artwork and the job. When starting a new painting, he creates a model of his chosen subject to paint from like a found object sculpture. He has a collection of mannequin heads and busts that he uses as a base, then starts the search for elements and props to wrap around the heads. Sometimes he needs to search online for just the right item that he has in his mind. In a way, he’s participating in the same quest for the most appropriate elements to convey a message, but in many cases foreign objects make their way into the final model. Norris sees that as a key part of the design. No one can compile their identity flawlessly, no matter how hard they try to sand the random and idiosyncratic edges of their lives. While some of the portraits are self-explanatory, like Announcer—a media entity with a head comprised of headlines—or carry a sense of humor like the helmeted Blogger, others are a little more haunting. Some people have told Norris that they see the figures as having a mummy quality. I can’t shake a sense of unease while looking at some of his portraits, something like a concern for the individuals being smothered beneath their masks. The subject in Passenger, in particular, seems trapped. Posed as the person driving would see them, facing straight out of an unseen window. The Passenger is strapped in, passive, equipped with useless goggles over a blindfold. Norris grew up in Kentucky and now resides in Jonesboro, Arkansas, where he is one of those people he spoke of with several jobs and roles: painter, peer to other regional artists, and an Assistant Professor of Art at Arkansas State University. His work has been exhibited around the country, but primarily in the South, but it wasn’t until he spent time in New York City early on that he became aware of how his cultural background might make a bigger first impression than his talents. Norris feels that while his work calls attention to issues everyone faces, his experience living as “the Other” gave him another found object to consider, another element to either embrace or leave buried in the closet. We pull from the South, and it pulls from us, an indecisive balance that some ignore and others ponder. John Harlan Norris’ work on display now at the Acadiana Center for the Arts as part of a group show titled Face Time. Visit his website for more paintings and a short video that shows him at work. Ryan Sparks tries to present a consistent identity on Twitter and Instagram, but often fails.